​Giant Metal Dog Head Fortnite is part of this week’s challenges in Fortnite asking players to dance on top of a giant metal dog head. Time is running out to level up your Season 8 Battle Pass and complete enough challenges to obtain The Prisoner skin. Epic Games usually doesn’t give very many clues as to where to complete these sorts of challenges, but this week, the “metal” part of the challenge gives a pretty good clue. Here's where to dance on Top of A Giant Metal Dog Head in Fortnite. 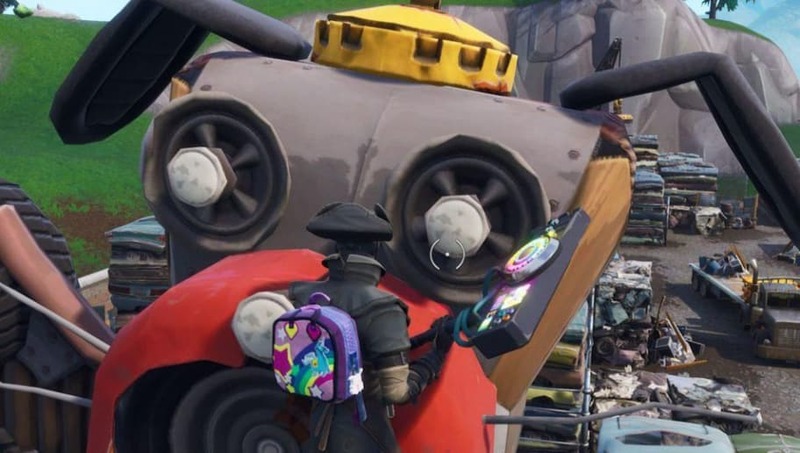 You can find the Giant Metal Dog Head in Junk Junction. This area of the map is sure to see a lot of action this week as one of the challenges is also an elimination challenge in the Junk Junction. This giant metal dog isn’t exactly a piece of junk though. Despite being made out of junk, it really is a piece of art. This part is pretty straightforward - build up or jump on his head and dance to complete the challenge. Keep in mind this is the third part of the “Dance on a Sundial, an over-sized cup of coffee, and a giant metal dog head” challenge, so you’ll need to complete the first two steps before you dance on the giant metal dog head. If you’re looking to complete these challenges quickly, just drop down to them, dance, and exit back to the lobby.